What Kind of Leaves Are These? At the end, we analyzed what was termed “gold leaf” jewelry, i.e. a ring and a pair of earrings. 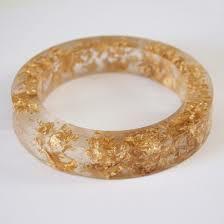 The style of these pieces was thin gold leaf foil embedded in resin. The owner was one of the younger students in the lab and she had purchased the jewelry herself from a relatively well-known designer’s collection. The goal was to measure for the presence of gold. 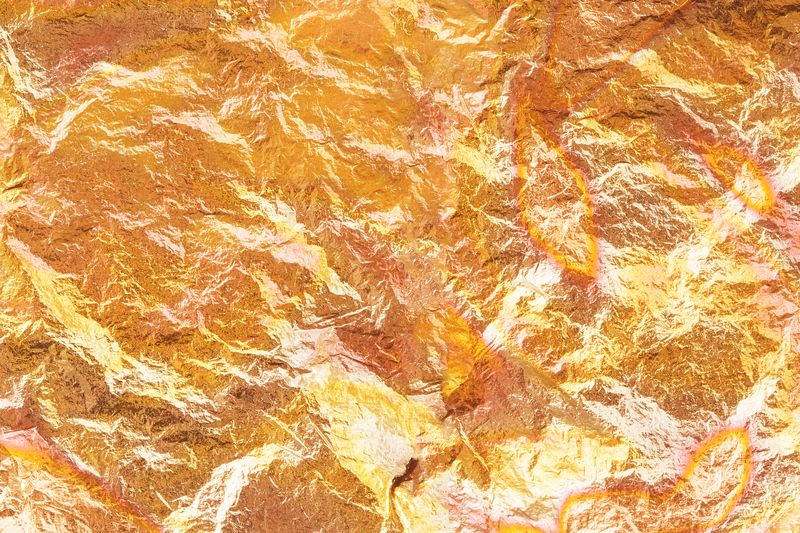 Since the gold leaf was embedded in resin, XRF was the ideal tool to measure the pieces non-destructively. The jewelry also had some rather odd topography at times given the surrounding resin, but the Orbis had no problem to target the gold leaf given the co-axial geometry of the exciting X-ray and video imaging. I would have liked to have used the excuse that we couldn’t target the sample accurately because of XRF system geometry. There was no gold. Copper / Zinc alloy. That was it. She had paid about $30 US for the earrings and she said she felt cheated. I kept thinking “Cheated? Maybe … live a little, wait until you buy a house!” Later, I was searching the internet looking for a technical definition for “gold leaf”. I knew I was onto something when I found a webpage that said that gold leaf was “traditionally” 22K gold thin foil used for gilding. The page later described modern Copper/Zinc alloy metal leaf “… offering the same rich look of gold leaf, but at a fraction of the price….” Apparently, this metal leaf can be found at art stores. Who knew? From there, we went on to the state of Sao Paulo and did a workshop at the Center for Nuclear Energy in Agriculture at the University of Sao Paulo. During the workshop, some of the students gave presentations on their work. I saw a very interesting experimental setup with live plants being measured in the Orbis. The plant’s roots were placed in a water bath doped with various forms of minerals or fertilizers. The whole plant, roots, stem, leaves, was then inserted into the Orbis and the stem was measured to monitor the uptake time for the relevant components in the bath. The plants could be moved in and out of the chamber to monitor the uptake over extended periods of time and over various portions of the plant. On the way to the Sao Paulo airport, I had the pleasure of sitting in the longest traffic jam I have ever endured with the monotony being broken by roaming snack and beverage vendors. It was quite the sight to watch the peanut vendors carrying propane fueled peanut warmers traversing the lane dividers on the highway with the occasional motorcycle speeding between the cars along the same lane dividers. Tip for next time … buy the Brazilian produced chocolate before going to the airport. The selection at the airport is rather limited and you never know when you may be having more fun than humans should be allowed to have watching motorcycles and peanut hawkers. Growing up outside of Detroit, MI, automobiles were ingrained in the culture, particularly American muscle cars. I was never a car buff but if I said little and nodded knowingly during these car discussions, I could at least survive. Engine displacement? Transmission? Gear ratios? Yep, just nod your head and grunt a little bit. Well, it turns out working at EDAX that I’ve run into a couple of serious car restoration experts. There always seems to be a common theme with these guys: how do I get more power out of this engine? Recently, one of these restoration experts brought in a small section of the rotor housing of a Mazda engine circa early ‘80s. Turns out, this guy likes to rebuild Mazda engines, tweak the turbocharging and race them. As we all know, Mazda was famous for commercializing the Wankel engine, aka the rotary engine, to power their cars. Rotary engines are famous for their simplicity and the power one can generate from a relatively small engine displacement. These engines are also infamous (i.e. poor fuel consumption and emissions) as well which has led Mazda to end general production in roughly 2012 with the last of the production RX-8s. Now, one of the questions in rebuilding these engines is how to repair and resurface the oblong rotor housing. In older engines of this type, the surface of the rotor housing can suffer deep gouges. The gouges can be filled and then need to be resurfaced. Initially, we imaged the cross-section of the rotor housing block in an Orbis PC micro-XRF spectrometer to determine what was used to surface coat the rotor housing. If you read up on this engine, (it’s a 12A variant), the block is aluminum with a cast iron liner and a hard chromium plating. The internet buzz claims the liner is installed via a “sheet metal insert process”. And when I google “sheet metal insert process” all I get are links to sheet metal forming and links referring to webpages which have copied the original reference to “sheet metal insert process”. In the following Orbis micro-XRF maps (Figures 1a and 1b), you can see the aluminum rotor housing block and the cast iron liner. Each row of the map is about 100 µm wide with the iron liner being about 1.5 mm thick. If you look carefully, you can also see the chrome coating on the surface of the iron liner. On the cross-section, which was done with a band saw cut, the chrome coating is about one map pixel across. So, it’s less than 100 µm thick. 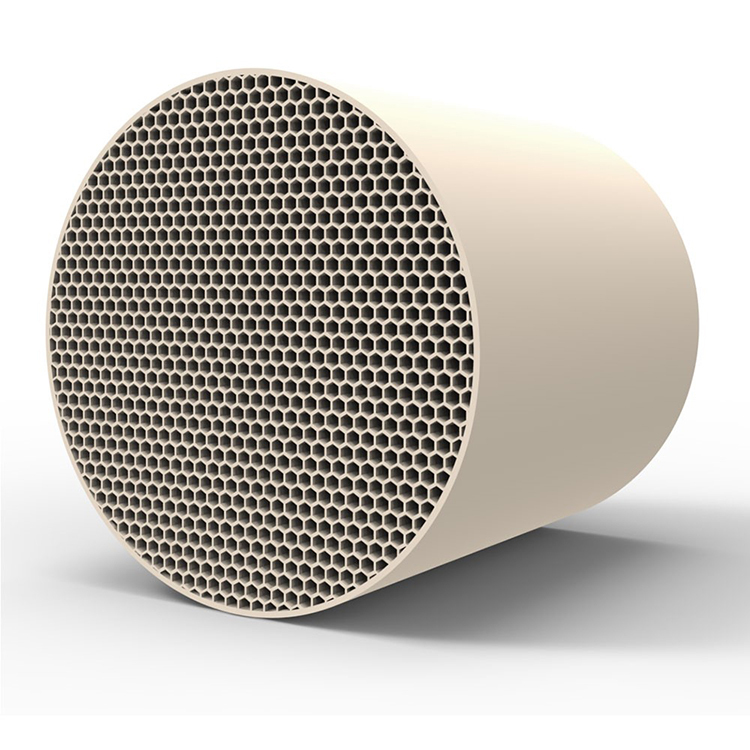 From web searches, hard chrome plating for high wear applications start at around 25 µm thick and range up to hundreds of microns thick. For very thick coatings, they are ground or polished down after the plating process to achieve more uniform application. So, what is found in the elemental map is consistent with the lower end of web-based information for a hard chrome coating, bearing in mind that the coating measured had well over 150k miles of wear and tear. If we had a rotor housing with less wear and tear, we could use XRF to make a more proper measurement of the chrome plating thickness and provide a better estimate of the original manufacturer’s specification on the hard chrome thickness. Figure 1b: Total counts map: Lighter elements such as Al generate fewer X-ray counts and appear darker than the brighter, heavy Fe containing components. We did have a look at the chrome coating by direct measurement with both XRF, looking for alloying elements such as Ti, Ni, W and Mo, as well as SEM-EDS looking for carbides and nitrides. We found that it’s simply a nominally, pure chrome coating with no significant alloying elements. 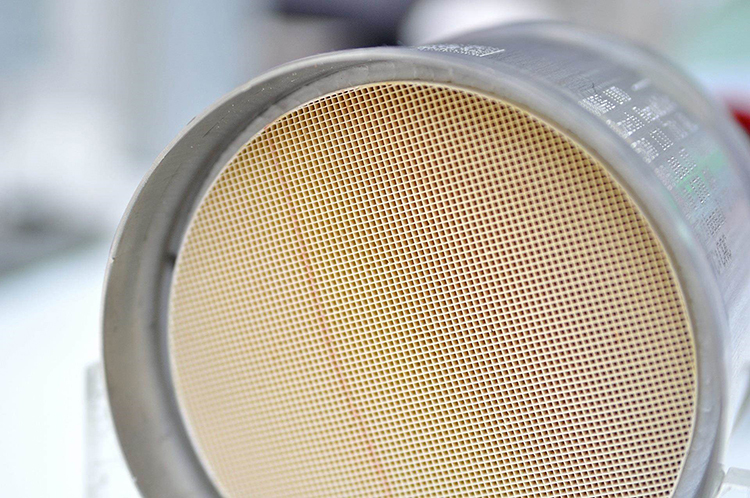 We did see some oxygen using SEM-EDS, but that would be expected on a surface that has been exposed to high heat and combustion for thousands of operating hours. Again, these findings are consistent with a hard chrome coating. In some on-line forum discussions, there was even speculation that the chrome coating was micro-porous to hold lubricant. 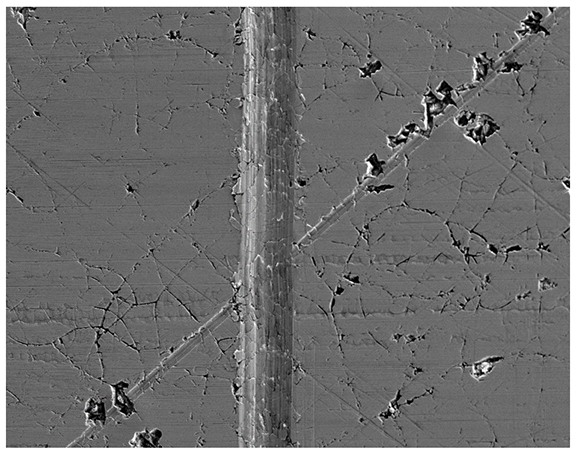 So, we also looked at the chrome surface under high SEM magnification (Figure 2). There are indeed some voids in the coating, but it doesn’t appear that they are there by design, but rather that they are simply voids associated with the metal grain structure of the coating or perhaps from wear. 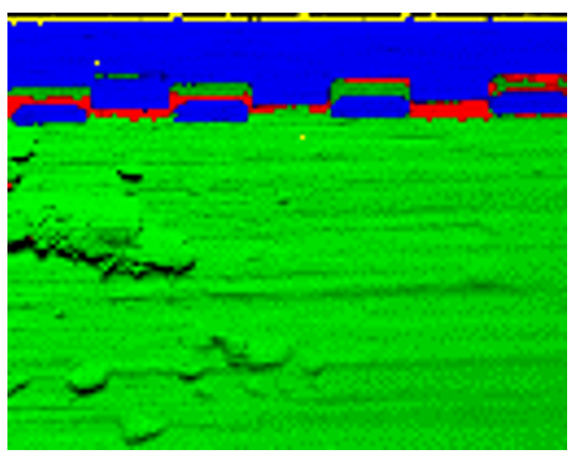 We specifically targeted a shallow scratch in the coating, looking for indications of sub-surface porosity. The trough of the scratch shows a smearing of the chrome metal grains but nothing indicating designed micro-porosity. Figure 2: SEM image of chrome plated surface of rotor housing liner. 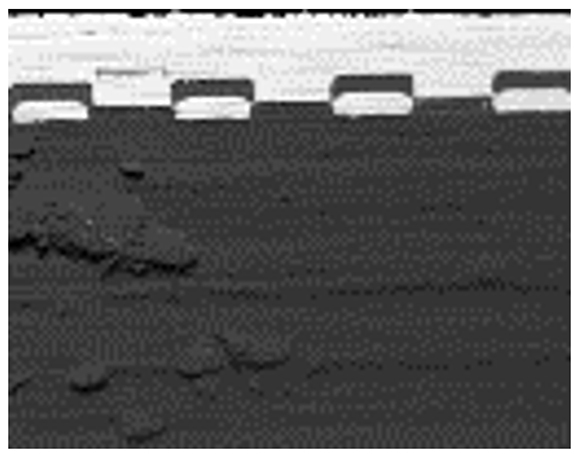 The scratch running vertically in the image is about 120 µm thick. The XRF maps in Figure 1 also provides some insight into the sheet metal insert process. The cast iron liner appears to be wrapped in ribbons of aluminum alloy and iron. The composition of the iron ribbon (approximately 1 wt% Mn) is about the same as the liner. But, the aluminum alloy ribbon is higher in copper content than the housing block. This can be seen in the elemental map (Figure 1a) where the aluminum ribbon is a little darker green, lower Al signal intensity, than the housing block itself. The map also shows a thread of some zinc bearing component running through (what we speculate are) the wrappings around the liner. My best guess here is that it is some sort of joining compound. Ultimately, the sheet metal insert process involves a bit more than a simple press or shrink fit of a cylinder sleeve in a piston engine block. Nod knowingly and grunt a little.